Business Tip #3: Find an underserved niche, then provide that audience with the tried & true product they want. At the beginning of the decade, MC Hammer had a huge hit where he pondered, “What’s it gonna take in the 90s to burn the charts, legit.” Burn the charts he did, as U Can’t Touch This was as ubiquitous that year as Vanilla Ice choreography and Kid ‘n Play Haircuts. Speaking of hairstyles, in 1990 Hair ‘Metal’ bands were fading and it was still a year away from the release of Nevermind. Which left just enough room for The Black Crowes, and their brand of 70s Southern Rock, to become an unlikely hit. The Crowes borrowed as much as they inspired. The chorus of Seeing Things sounds eerily reminiscent of Joe Cocker’s version of With a Little Help From My Friends. On the other hand, it would be difficult to believe Guns ‘n Roses didn’t hear Sister Luck before recording their take on Knockin’ on Heaven’s Door. 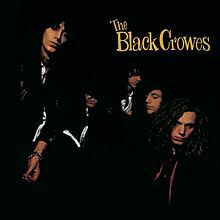 The common thread between these Black Crowes originals, Joe Cocker/GNR covers, and Beatles/Dylan originals for that matter, is timeless quality. Shake Your Money Maker’s ten solid tracks, including the memorable She Talks To Angels, brought classic rock into the 90s. Though the classic label shouldn’t be confused with fossilizing in any way as this one’s aged as well as any of the 1990 releases from the 1001 Albums list. This is one of Brian’s go-tos for a road trip, just a classic sing along! Throw your hair back and enjoy the ride kind of cd! Agreed – I’ve been singing along for years incorrectly, I recently learned the lyric in Hard to Handle is, “Hey little thing let me light your candle ’cause mama I’m sure hard to handle, now,gets around” – who knew? !